The “Infectious Diseases Twitter Highlights” column presents recent twitter posts that are of particular interest to the infectious diseases community and provides commentary. This is the summary for the fourth week of July 2017. British Society for Antimicrobrial Chemotherapy’s response to the article is here. Commentary: This article calls into question the commonly held belief that “completing the full course” of antibiotics prevents the development of antibiotic resistance. The authors point out that taking antibiotics for longer than necessary is what leads to the development of resistance, rather than taking a shorter course of antibiotics. Even though there is a lack of evidence showing that stopping an antibiotic treatment early will lead to an increased risk for a resistant infection, this is still a very common misconception, including among health care professionals. The ultimate goal is to select the most appropriate antibiotic at the right dose for the right indication and for an appropriate duration of therapy. Using an antibiotic for longer than necessary puts the patient at increased risk for unwanted side effects and development of resistant infections. Encouraging patients not to complete the course of antibiotics could result in under treatment and development of resistance. It is clear that this topic is highly debated and more research needs to be done to provide the best evidence-based answers to how long an individual patient should really be taking their antibiotics. We also need to find a better way to educate the public about the risks of inappropriate antibiotic use. An additional article that discusses this topic and is recommended was published by Dr. Brad Spellberg (@BradSpellberg) and is available here. Commentary: Although school has not started yet, it is never too early to start thinking about report cards. 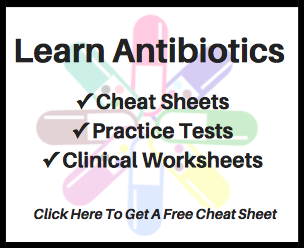 This document published by the CDC is the closest thing we have to a report card on antibiotic use and antimicrobial stewardship in the United States. In addition to the usual facts and statistics, the document has a ton of educational tools, graphics, and handouts for several audiences (links also provided throughout!). My favorite takeaway though was the link to the Antibiotic Resistance Patient Safety Atlas. This database provides information on antibiotic prescribing by state, age group, and over time from 2011–2014. As a bonus, you can also click a link on the top of the page and see stats on the status of Antibiotic Stewardship in the U.S. I love the Orange and Blue colors (Go Gators! )… but realize we still have opportunities with fluoroquinolone prescribing in Florida. Commentary: Despite the new Black-box warnings and the adverse consequences such as C. difficle infection (CDI), fluoroquinolones (FQ) remain one of the most frequently prescribed antibiotic classes in the United States. This multicenter, quasi-experimental study assessed the impact of a respiratory FQ education and restriction program on utilization, appropriateness of therapy, and CDI rates. Clinicians were first educated about the use of FQ’s over a 3-month period, followed by a restriction policy in which pharmacists prospectively reviewed all FQ orders to verify appropriateness. FQ’s were only allowed to be used for previously approved indications or had to be ordered from an infectious disease physician. The study had positive results demonstrating that incorporating a restriction program for FQ’s resulted in improved appropriate use of FQ’s and significant reduction in overall utilization, acquisition cost, and CDI rates. (win, win, win!) Even with these positive results, having an antibiotic stewardship-driven restriction program for FQ’s might not be very feasible at every institution. FQ’s remain a commonly used class in hospitalized patients, especially patients with pneumonia and beta-lactam allergies. Some institutions may not have the resources needed to prospectively review all FQ orders without leveraging the EMR at order entry. On top of this, restricting a common antibiotic class from physicians may create drawbacks by impacting physician autonomy without proper education and support from medical staff leadership. Antimicrobial stewardship programs are not here to police providers, they are here to improve systems and practices that support the rational use of antimicrobial agents. Commentary: Surgical site infections (SSIs) are the most common type of hospital-acquired infection (HAI), accounting for around 20 percent of all HAIs. Of those undergoing an inpatient surgery, an SSI will occur in 2 to 5 percent of those patients. The incidence of SSIs in the United States ranges from 160,000 to 300,000 annually, leading to a large cost burden of $3.5 billion to $10 billion per year. According to the CDC, in 2010 there around 16 million surgical procedures performed in acute care hospitals in the United States. Prevention of SSIs is growing in importance, because of the increasing number of surgical procedures performed each year. In this systematic review and meta-analysis, the effect of timing of preoperative surgical antibiotic prophylaxis on SSIs was assessed and the different timing intervals were compared. This study showed that there was no significant difference in SSI rates between antibiotic administration 120-60 minutes or 60-0 minutes prior to the first incision. However, when antibiotics were administered after the first incision the risk for a SSI almost doubled and if antibiotics were administered more than 2 hours before the first incision the risk for an SSI was over 5 times greater. A strength of this study was the large sample size of 54,552 patients, but it left many questions still unanswered. This study could only conclude that prophylactic antibiotics should be administered within 120 minutes prior to the first incision, but could not identify the optimal time frame within that 120 minutes that would lead to the lowest rates of SSIs. It also does not tell us the optimal timing of antibiotic administration for different types of surgeries or for different antibiotics. Is the optimal time different for vancomycin (long infusion, long half-life) vs cefazolin (short infusion, short half-life)? Hopefully future studies in this area can provide this valuable information. Commentary: In 2011, Clostridium difficle caused around 500,000 infections and about 29,000 deaths in the US within 30 days of the initial diagnosis. Currently, there are 3 primary treatment options for C. difficile: oral vancomycin, metronidazole, and fidaxomicin. C. difficile infection (CDI) recurrence with oral vancomycin or metronidazole within the first 2 months of treatment is 13-47% and the risk of recurrence increases with each subsequent episode. Recurrent CDI has a 2.5-fold higher hospital readmission rate and 33% higher 180-day mortality rate than primary CDI, which shows there is a definite need for better therapies to prevent and treat CDI. Bezlotoxumab is a unique agent for the prevention of CDI. It is a monoclonal antibody that binds to the C. difficle exotoxin TcdB, which neutralizes and prevents this exotoxin from entering the gut endothelium and causing damage. Some pros of Bezlotoxumab are that it is one of the limited number of medications available to prevent CDI, only requires a one-time dose of 10mg/kg IV infusion over 60 minutes, and had a relatively good safety profile (unless you have heart failure). Some cons of Bezlotoxumab include not knowing the benefits of this new drug beyond 12 weeks since the follow-up period during clinical trials was only for 12 weeks, only providing prevention of CDI but not treatment (active CDI would need to be treated with another agent), and the hefty average wholesale price for one, 1000mg vial is $4,560 USD. When fidaxomicin was compared to oral vancomycin in the original phase 3 studies, the rate of CDI recurrence was ~15% with fidaxomicin and ~25% with vancomycin. This means there is an absolute risk reduction of 10% (ARR) in the recurrence of CDI with fidaxomicin, and a number needed to treat of 10. The rate of CDI recurrence of Bezlotoxumab compared with placebo was 16.5% and 26.6%, respectively, which means Bezlotoxumab had a similar ARR of 10% and a number needed to treat of 10 as well. In my opinion, since fidaxomicin and bezlotoxumab have the same ARR for the recurrence of CDI, fidaxomicin would be the more economical choice due to the lower cost compared to bezlotoxumab. However, bezlotoxumab may play a role in patients who are at higher risk for recurrent CDI and have previously failed other alternatives. Further clinical and pharmacoeconomic studies are needed to identify the best fit in this challenging population. Guest Contributor: John D’Arcangelis, PharmD Candidate Class of 2018, is a pharmacy student from the University of Florida College of Pharmacy and advance pharmacy practice experience student at Sarasota Memorial Hospital in Sarasota, Florida. He is acknowledged as a contributing author for this article.